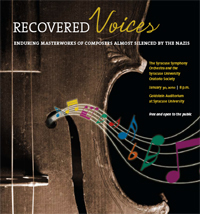 The Syracuse University School of Education has partnered with the Syracuse Symphony Orchestra (SSO), the SU Oratorio Society and the Syracuse International Film Festival to present a special concert performance, “Recovered Voices: Enduring Masterworks of Composers Almost Silenced by the Nazis,” on Saturday, Jan. 30, at 8 p.m. in Goldstein Auditorium in the Hildegarde and J. Myer Schine Student Center on the SU campus. Tickets for the concert are free and available to SU students, faculty, staff and the general public by calling the Schine Box Office at (315) 443-4517. Free tickets are also available at Temple Adath Yeshurun, Temple Concord and Congregation Beth Sholom-Chevra Shas. Free event parking will be available in the Waverly and Marion lots on Waverly Avenue, the Lehman and Harrison lots on University Avenue, and in any of the Quad lots. The rule of the Nazi regime invokes thoughts of profound loss and human suffering. The “Recovered Voices” event celebrates the resilience of the creative spirit of those who endured this bleak period in history and whose masterful works survived suppression to inspire future generations. The evening’s musical program, conducted by SSO musical director Daniel Hege, will feature the works of composers Maurice Ravel, Erwin Schulhoff and Alexander Zemlinsky, with Franz Schreker’s “Schwanensang” performed by the SU Oratorio Society under the direction of Elisa Dekaney, faculty member in SU’s School of Education and College of Visual and Performing Arts (VPA). Film accompaniment to the musical program has been produced by the Syracuse International Film Festival and Owen Shaprio, the festival’s artistic director and professor of film in VPA. Spoken word narration will also accompany the music and display of visual art and images of life during the period in which the music was written. The “Recovered Voices” event is a Chancellor’s Leadership Project and part of the Regional Holocaust and Genocide Initiative: Resistance, Resilience and Responsibility. The goal of the initiative is to keep alive the memory and lessons of the Holocaust and past and current genocides through education and public dialogues about law, justice and ethics. Event co-sponsors include Marilyn Ziering, the Ziering Family Foundation, Joseph Cangemi, Sharon H. Jacquet, Alice G. Kendrick and Jeryl A. Mitchell. For more information about the “Recovered Voices” concert event, visit http://soe.syr.edu. For questions, to reserve tickets, or to arrange group attendance, contact Victoria Kohl at 443-7773 or vfkohl@syr.edu. To learn more about the Chancellor’s Leadership Project, the Regional Holocaust and Genocide Initiative: Resistance, Resilience and Responsibility and upcoming arts and education events, contact SU Professor Emeritus Alan Goldberg at agoldbe1@twcny.rr.com.